Zaruma Ecuador, a UN Heritage City, is South of the big city Guayaquil that most people who fly out to the Galápagos Islands will recognize as the jumping off place for Darwin’s famous islands. Zaruma is built on top of what locals call Montaña de oro (Mountain of Gold) and it literally is. There are tiny flecks of gold deep inside Montaña d’Oro that miners extracted using liquid mercury to dissolve the gold from the dirt. Miners then heat the mixture of gold and elemental mercury, which evaporates the liquid mercury so the gold can be recovered. As a result of heating the elemental mercury, invisible, toxic mercury vapor is released in vast quantities into the air, poisoning everyone nearby, including babies and dogs. Despite the fact that Ecuador has signed The United Nations Environment Programme’s (UNEP) Minimata Convention on Mercury which was aimed at curbing the worldwide release of anthropomorphic mercury pollution, Ecuador continues to allow the illegal import of mercury in huge quantities to fuel both the legal mining operations and the artisanal do-it-yourself miners, who often “Burn Gold” by heating the amalgam on a camp fire or even in the kitchen. According to the World Health Organization mercury is a biocumulative toxin that builds up over time in critical areas such as the kidneys, heart and brain. Miners eventually become so sick they can’t support their families, while they tremor and shake in misery. Some of the most reliable symptoms of insidious mercury poisoning is pain; headache, kidney dysfunction, muscle aches, and intestinal problems. 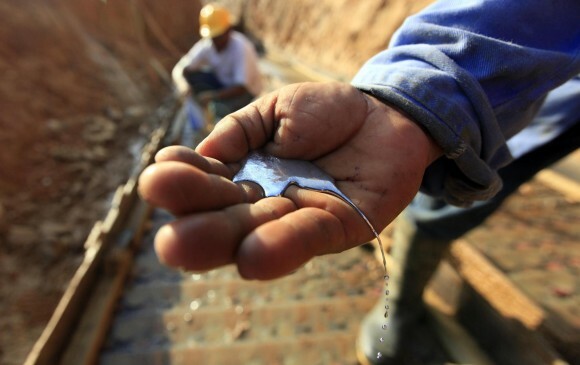 A total of 36 miners took part in a randomized controlled trial on the efficacy of Irminix® on mercury intoxication. The study was divided in to 3 groups. One group received 100 mg/day the second received 300 mg/day and the third received a placebo until after the study was done at which time they received the mercury antidote. The participants came to the same local hospital daily to receive their medications and meet with the investigators. Biological samples were taken before during and after the study for analysis. In just 14 days Irminix® dramatically reduced all the symptoms at the 300 mg/day dose and definitely improved them at the 100 mg/day without any significant side effects. Even in this worst case scenario Irminix® dramatically improved the gold miners quality of life. How was all this improvement possible in just two weeks after a lifetime of toxic exposure? After taking Irminix®, the urinary mercury dropped dramatically, pain was reduced, tremors stopped or minimized, excessive salivation and metallic taste were reduced as well. When the miners consumed the 300 mg capsule of Irminix® there were approximately 45 molecules of Irminix® for every molecule of mercury that was causing them harm. Unfortunately, some of the harm from mercury is permanent and Irminix® is not a drug designed to treat anything. It captures mercury, free iron and free radicals. And it does it fast. The 100 mg group got better but not as well as the 300 mg group. Dr. Haley feels this was due to the enormous oxidative stress both groups must be experiencing since mercury releases free iron and that turns mitochondria into free radical producing factories instead of energy factories. In fact, one of the biggest changes seen in this trial was increased energy which indicates that the mitochondria began to recover their capacity to make energy instead of free radicals. While the miners who took 300 mg/day improved the control group apparently got worse. This is reflected in this graph and their urine mercury as well because all the citizens in Zaruma were being continually exposed to mercury by the gold mining operators who refused to stop polluting the air with mercury. This study would indicate that Irminix® is both safe and effective at chelating mercury and thereby reducing the symptoms associated with mercury exposure. In addition to environmental exposure, there are a great many products that still contain mercury and those exposed would likely benefit greatly from a similar round of treatment.